A comforting plant based meal made with pumpkin and fall flavors. Prepare spaghetti noodles according to package instructions. Set aside. Heat olive oil in a large pan over medium heat. Saute the minced garlic for 1 minute or until aromatic. Stir in the flour and nutrition yeast, cooking until lightly browned (about 1 minute). Slowly pour in the non-dairy milk. Continuously whisk the mixture to prevent clumping. Add in the pumpkin, whisking to combine. Add salt, sage, and red pepper flakes. Bring to a boil, then reduce heat to a low simmer. Simmer until sauce is thick and creamy, about 2-3 minutes. If the sauce gets too thick, add additional non-dairy milk or pasta water to thin it down. 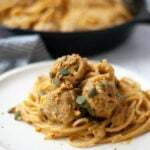 Combine cooked spaghetti, pumpkin sauce, and pumpkin bean balls. Top with additional red pepper flakes, fresh sage, pumpkin seeds, and fresh ground black pepper. Prepare the flax egg by mixing ground flax seed and water together in a small dish. Let rest for three minutes before using. Drain and rinse the beans. Pat dry with a towel to remove excess moisture. Combine all ingredients in a food processor. Processor until mostly broken down but not entirely pureed. Let the mixture rest in the fridge for at least 30 minutes. This makes it easier to form the bean balls. Form the refrigerated mixture into 10-12 ping pong sized balls. To prepare by frying, heat 1 tablespoon of canola oil in a medium pan. Add the bean balls to the hot oil, stirring occasionally to brown all sides. They are ready when the outsides are lightly browned and crispy. Alternately, prepare the bean balls by adding them to the simmering pumpkin sauce. Cook for about 10 minutes, until warmed through.